From the time my daughters were old enough to sit up in a high chair I had them in the kitchen with me. I gave them measuring cups and spoons to play with. As they got older I involved them with pouring, measuring, stirring, peeling and mashing. Kids who are involved in the kitchen helping prepare meals and snacks often eat a wider variety of healthy foods just because they helped. Helping in the kitchen and learning to cook provides children with a variety of life skills that they will need as adults. 1. Be patient and allow extra time to teach, supervise and clean up. 2. You know your child best. 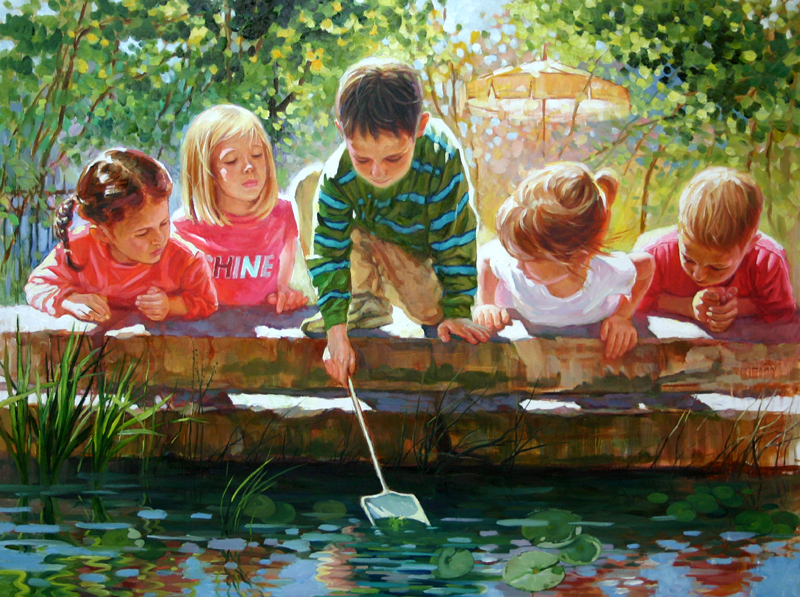 Give them age appropriate tasks and look for signs of boredom, frustration and enjoyment. Adjust the tasks to your child’s level of maturity and interest. And never punish or yell at your child for making a mistake or a mess while learning. The goal is to make cooking a positive experience. Think back to when and how you learned to cook. 3. Always supervise your child when using knives and when learning to peel foods like potatoes or cucumbers. And of course when cooking on the stove or using the oven. 4. 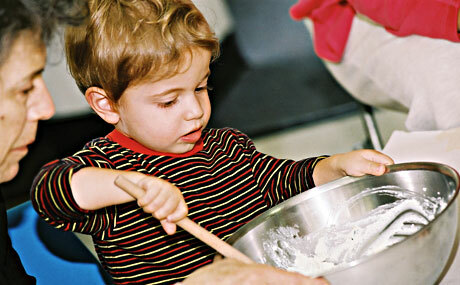 Select a simple recipe that your child can help with and feel a sense of accomplishment when it is served. 5. Involve your kids in the everyday preparation of the meals and snacks you eat. They don’t have to be in the kitchen with you from start to finish. You could involve your child in one or two small tasks or have them help pack their lunch by putting food into storage containers or bags. Children can also learn portion control by count out a serving of crackers or measure a serving of almonds and put them into individual containers for snacks. Whether you are traveling by car or by plane, heading to a campsite, taking a road trip or off to a hotel or resort destination, I’ve got some healthy eating tips for you. Some of Some of the best accommodation values are to rent a house, condo or timeshare. 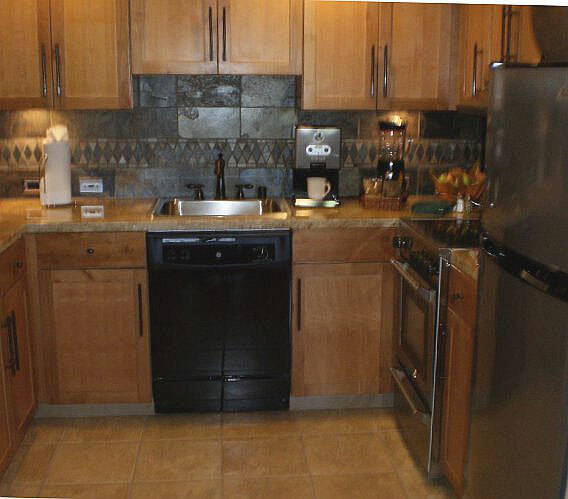 All of these come with sizeable kitchens, making it easy to prepare healthy food while you are away. I’ve had good experiences with two Timeshare rental sites: www.Redweek.com and www.MyResortNetwork.com. If you are staying at a hotel, you may have a small refrigerator and possibly a microwave oven. Camping would give you more options for cooking, but no electricity and no refrigeration. Keep in mind that an ice chest may not keep items as cold as a refrigerator. If you are flying to a destination where you will have a full kitchen, check out the options for grocery shopping by contacting the place where you will be staying or checking online. See what I bought and have been preparing in Cancun by clicking here. I recommend that if you are going to be preparing food while away, that you bring a roll of paper towels, a sponge and some dishwashing soap. Not all places provide these items. You may also want to bring storage containers or plastic bags to store leftovers in. Regardless of where your destination is and if you are driving or flying, I recommend making a “Travel Snack Bag” for each person traveling. Some favorites to pack are pretzels or crackers, a banana, apple or other fruit, cut up carrots, red bell peppers or celery, and trail mix or almonds. You could also include a sandwich. (Be aware that with the limitation of liquids on flights, this also applies to drinks and some foods, such as yogurt.) Of course, if you are driving and have cup holders, everyone can have their own water. Have your family help make up their own bags and write their name on their bag. It gives everyone the ability to eat anything out of their bag along the way without having to ask or say they don’t like any of the choices. Happy Travels! Healthy Travels – I made this on vacation! While vacationing in Cancun, where we have a full kitchen, we have prepared most of our meals! One trip to Costco allowed us to get fresh lettuce, asparagus, apples, zucchini, spinach, broccoli, string beans, bell peppers, cucumber, onions, corn on the cob, carrots, mangos, soy milk, frozen blueberries and strawberries, canned tuna, and frozen salmon and chicken. I brought a small George Foreman Grill that we’ve been cooking the salmon and chicken on, along with the asparagus and some of the zucchini. I also brought along some rice, seasonings, prepackaged cooked lentils, protein powder, and almonds. At a local market we purchased salad dressing, pasta sauce, olive oil, oatmeal, bananas, oranges, a watermelon and a Mexican papaya. We cooked half of the apples by dicing then cooking them on the stove until soft. We’ve used the cooked apples on oatmeal and to make vanilla-apple shakes made with soymilk and vanilla protein powder. Banana and blueberries are also great on oatmeal. And since we have a blender here, we have been able to whip up shakes and fresh fruit and vegetable smoothies. 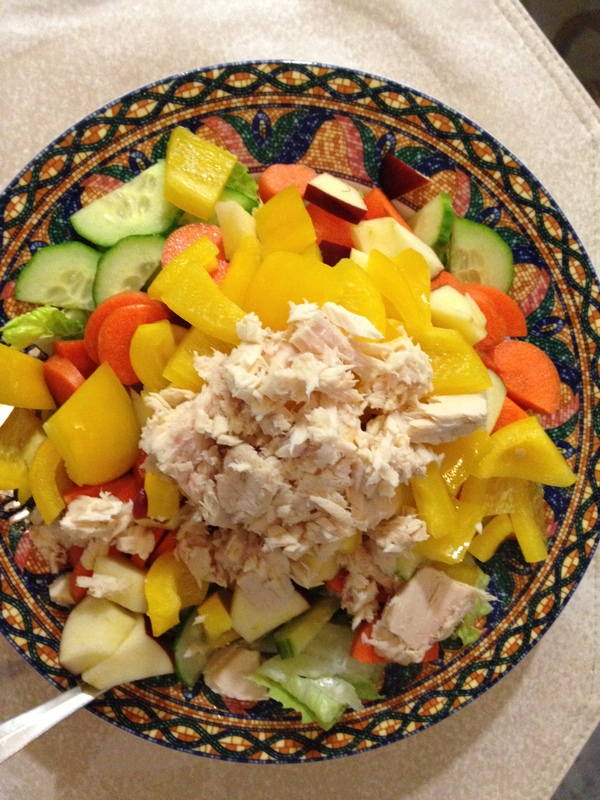 The salad in the photo above is made from cut up raw vegetables and apple on a bed of lettuce topped with tuna, then we put our own salad dressing on it. One of my favorite meals has been sautéed vegetables with rice and lentils. We all have been enjoying plenty of fruit and raw, steamed, sautéed and grilled vegetables! With a little planning and creativity you too can enjoy eating well while on vacation.